Air Elemental cries a little bit more. This is a unique effect and feels very strong to me. While the initial effect is very blue, it's also odd enough that I wonder if we're going to see one of these "reveal to do [x] at the beginning of your first upkeep" cards for every color. A variant on leylines. Nice. I suppose it's easier to make spell-like leyline effects. Potential scry 6 or 9 before my first draw on turn 1? Scry 3, Scry 3 is not nearly as good as Scry 6. Nice to see "reveal from your opening hand" cards in this set. 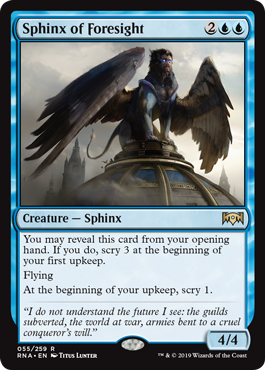 The most usable Sphinx ever made?